The Brittany BY635 is a wider version of the BY630. 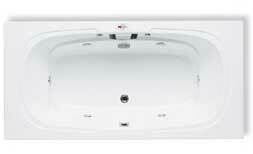 The Brittany BY635 is a French inspired whirlpool bath tub for two people. The spacious BY630 also features flowing armrests, lower lumbar support and jets at both ends of the tub for simultaneous back and foot massage. Call 800-720-1062 for more details.